With Xcode 6.3 there were new annotations introduced for better expressing the intention of API's in Objective-C (and to ensure better Swift support of course). Those annotations were of course nonnull, nullable and null_unspecified. Pointer is missing a nullability type specifier (_Nonnull, _Nullable or _Null_unspecified). 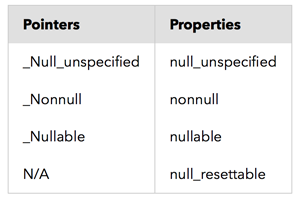 For properties I should use nonnull, nullable, null_unspecified. For method parameters I should use nonnull, nullable, null_unspecified. For C methods I should use __nonnull, __nullable, __null_unspecified. For other cases, such as double pointers I should use _Nonnull, _Nullable, _Null_unspecified. But I'm still confused as to why we have so many annotations that basically do the same thing. What is exact difference between those annotations, how to correctly place them and why? The nullability (type) qualifiers express whether a value of a given pointer type can be null (the _Nullable qualifier), doesn’t have a defined meaning for null (the _Nonnull qualifier), or for which the purpose of null is unclear (the _Null_unspecified qualifier). Because nullability qualifiers are expressed within the type system, they are more general than the nonnull and returns_nonnull attributes, allowing one to express (for example) a nullable pointer to an array of nonnull pointers. Nullability qualifiers are written to the right of the pointer to which they apply. So for method returns and parameters you can use the the double-underscored versions __nonnull/__nullable/__null_unspecified instead of either the single-underscored ones, or instead of the non-underscored ones. The difference is that the single and double underscored ones need to be placed after the type definition, while the non-underscored ones need to be placed before the type definition. As conclusion, you can use either ones, as long as the compiler can determine the item to assign the qualifier to. null_unspecified: bridges to a Swift implicitly-unwrapped optional. This is the default. nonnull: the value won’t be nil; bridges to a regular reference. null_resettable: the value can never be nil when read, but you can set it to nil to reset it. Applies to properties only. This will nullify the need for the code level 'nullibis' :-) as it sort of makes sense to assume that everything is non-null (or nonnull or _nonnull or __nonnull) unless otherwise noted. So with the exceptions to the exceptions and the inconsistent keywords eliciting the same functionality, perhaps the approach is to use the ugly versions __nonnull / __nullable / __null_unspecified and swap when the complier complains... ? Maybe that is why they exist in the Apple headers? Not the answer you're looking for? Browse other questions tagged objective-c nullable objective-c-nullability or ask your own question.